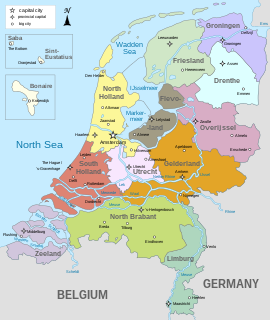 There are currently twelve provinces of the Netherlands, representing the administrative layer between the national government and the local municipalities, with responsibility for matters of subnational or regional importance. North Brabant, also unofficially called Brabant, is a province in the south of the Netherlands. It borders the provinces of South Holland and Gelderland to the north, Limburg to the east, Zeeland to the west, and Belgium to the south. The northern border follows the Meuse westward to its mouth in the Hollands Diep strait, part of the Rhine–Meuse–Scheldt delta. Neighbouring cities and towns include Son en Breugel, Nuenen, Geldrop-Mierlo, Helmond, Heeze-Leende, Waalre, Veldhoven, Eersel, Oirschot and Best. The agglomeration has a population of 337,487. The metropolitan area consists of 419,045 inhabitants. The city region has a population of 753,426. The Brabantse Stedenrij combined metropolitan area has about 2 million inhabitants. Son en Breugel is a municipality in the southern Netherlands just outside Eindhoven. The municipality covers an area of 26.51 km2 (10.24 sq mi) of which 0.56 km2 (0.22 sq mi) is water. It had a population of 16,763 in 2017. Son en Breugel used to be two different villages: 'Son' and 'Breugel', with the stream the Dommel separating the two villages. Son en Breugel also borders the following larger municipalities: Eindhoven, Meierijstad, Nuenen, Gerwen en Nederwetten, and Best. The spoken language is North Meierijs. Nuenen, Gerwen en Nederwetten is a municipality consisting of the larger village of Nuenen and two adjacent smaller ones. It is located in the province of Noord-Brabant, about 10 kilometres (6.2 mi) east of Eindhoven, the fifth largest city in the Netherlands. From being a small farmers town of less than 1000 inhabitants around 1950 Nuenen grew steadily as ever more new employees of Philips and the Eindhoven University (TUE) chose Nuenen as their new home. Geldrop-Mierlo is a municipality in the southern Netherlands, in the province of North Brabant. The municipality was created from the two former municipalities of Geldrop and Mierlo on 1 January 2004. The name derives from the contraction of the regional words eind (meaning "last" or "end") and hove (or hoeve, a section of some 14 hectares of land). Toponymically, eind occurs commonly as a prefix and postfix in local place- and streetnames. A "hove" comprised a parcel of land which a local lord might lease to private persons (such as farmers). Given that a string of such parcels existed around Woensel, the name Eindhoven may have originated with the meaning "last hoves on the land of Woensel". Woensel is a former town in the Dutch province of North Brabant, but nowadays a borough of Eindhoven. The written history of Eindhoven started in 1232, when Duke Hendrik I of Brabant granted city rights to Eindhoven, then a small town right on the confluence of the Dommel and Gender streams. At the time of granting of its charter, Eindhoven had approximately 170 houses enclosed by a rampart. Just outside the city walls stood a small castle. The city was also granted the right to organize a weekly market and the farmers in nearby villages were obliged to come to Eindhoven to sell their produce. Another factor in its establishment was its location on the trade route from Holland to Liège. Recorded history or written history is a historical narrative based on a written record or other documented communication. It contrasts with other narratives of the past, such as mythological, oral or archeological traditions. For broader world history, recorded history begins with the accounts of the ancient world around the 4th millennium BC, and coincides with the invention of writing. For some geographic regions or cultures, written history is limited to a relatively recent period in human history because of the limited use of written records. Moreover, human cultures do not always record all of the information relevant to later historians, such as the full impact of natural disasters or the names of individuals; thus, recorded history for particular types of information is limited based on the types of records kept. Because of this, recorded history in different contexts may refer to different periods of time depending on the topic. City rights are a feature of the medieval history of the Low Countries. A liege lord, usually a count, duke or similar member of the high nobility, granted to a town or village he owned certain town privileges that places without city rights did not have. Around 1388, the city's fortifications were strengthened further. And between 1413 and 1420, a new castle was built within the city walls. In 1486, Eindhoven was plundered and burned by troops from Guelders. The reconstruction of Eindhoven was finished in 1502, with a stronger rampart and a new castle. However, in 1543 it fell again, its defense works having been neglected due to poverty. A big fire in 1554 destroyed 75% of the houses but by 1560 these had been rebuilt with the help of William I of Orange. During the Dutch Revolt, Eindhoven changed hands between the Dutch and the Spanish several times during which it was burned down by renegade Spanish soldiers, until finally in 1583 it was captured once more by Spanish troops and its city walls were demolished. The Dutch Revolt (1568–1648) was the revolt of the northern, largely Protestant Seven Provinces of the Low Countries against the rule of the Roman Catholic Habsburg King Philip II of Spain, hereditary ruler of the provinces. The northern provinces (Netherlands) eventually separated from the southern provinces, which continued under Habsburg Spain until 1714. 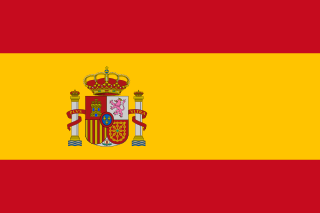 Spain, officially the Kingdom of Spain, is a country mostly located in Europe. Its continental European territory is situated on the Iberian Peninsula. Its territory also includes two archipelagoes: the Canary Islands off the coast of Africa, and the Balearic Islands in the Mediterranean Sea. The African enclaves of Ceuta, Melilla, and Peñón de Vélez de la Gomera make Spain the only European country to have a physical border with an African country (Morocco). Several small islands in the Alboran Sea are also part of Spanish territory. The country's mainland is bordered to the south and east by the Mediterranean Sea except for a small land boundary with Gibraltar; to the north and northeast by France, Andorra, and the Bay of Biscay; and to the west and northwest by Portugal and the Atlantic Ocean. Eindhoven did not become part of the Netherlands until 1629. During the French occupation, Eindhoven suffered again with many of its houses destroyed by the invading forces. Eindhoven remained a minor city after that until the start of the industrial revolution. The industrial revolution of the 19th century provided a major growth impulse. Canals, roads and railroads were constructed. Eindhoven was connected to the major Zuid-Willemsvaart canal through the Eindhovens Kanaal branch in 1843 and was connected by rail to Tilburg, 's-Hertogenbosch, Venlo and Belgium between 1866 and 1870. Industrial activities initially centred around tobacco and textiles and boomed with the rise of lighting and electronics giant Philips, which was founded as a light bulb manufacturing company in Eindhoven in 1891. Industrialisation brought population growth to Eindhoven. On the establishment of the Kingdom of the Netherlands in 1815, Eindhoven had 2,310 inhabitants. By 1920, the population was 47,946; by 1925 it was 63,870 and in 1935 that had ballooned to 103,030. The explosive growth of industry in the region and the subsequent housing needs of workers called for radical changes in administration, as the City of Eindhoven was still confined to its medieval moat city limits. In 1920, the five neighbouring municipalities of Woensel (to the north), Tongelre (northeast and east), Stratum (southeast), Gestel en Blaarthem (southwest) and Strijp (west), which already bore the brunt of the housing needs and related problems, were incorporated into the new Groot-Eindhoven ("Greater Eindhoven") municipality. The prefix "Groot-" was later dropped. The early 20th century saw additions in technical industry with the advent of car and truck manufacturing company Van Doorne's Automobiel Fabriek (DAF) and the subsequent shift towards electronics and engineering, with the traditional tobacco and textile industries waning and finally disappearing in the 1970s. 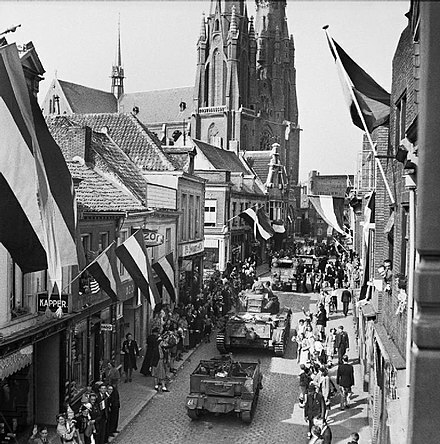 People of Eindhoven (during World War II) watching Allied forces entering the city following its liberation from Axis forces on 19 September 1944. A first air raid in World War II was flown by the RAF on 6 December 1942 targeting the Philips factory downtown. 148 civilians died, even though the attack was carried out on a Sunday by low-flying Mosquito bombers. Large-scale air raids, including the bombing by the Luftwaffe on 18 September during Operation Market Garden, destroyed large parts of the city. The reconstruction that followed left very little historical remains and the postwar reconstruction period saw drastic renovation plans in highrise style, some of which were implemented. At the time, there was little regard for historical heritage. During the 1960s, a new city hall was built and its neogothic predecessor (1867) demolished to make way for a planned arterial road that never materialised. The 1970s, 1980s, and 1990s saw large-scale housing developments in the districts of Woensel-Zuid and Woensel-Noord, making Eindhoven the fifth-largest city in the Netherlands. At the start of the 21st century, a whole new housing development called Meerhoven was constructed at the site of the old airport of Welschap, west of Eindhoven. 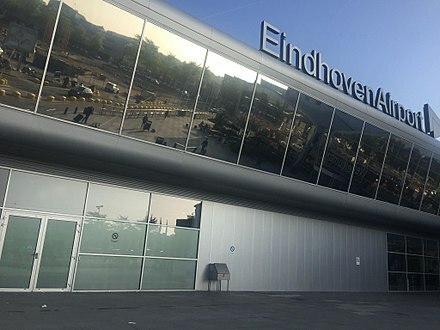 The airport itself, now called Eindhoven Airport, had moved earlier to a new location, paving the way for much needed new houses. Meerhoven is part of the Strijp district and partially lies on lands annexed from the municipality of Veldhoven. The large-scale housing developments of the 20th century saw residential areas being built on former agricultural lands and woods, former heaths that had been turned into cultivable lands in the 19th century. Eindhoven has an oceanic climate with slightly warmer summers and colder winters than the coastal parts of the Netherlands. Its all-time record is 36.7 °C (98.1 °F) set on 26 July 2018 and −21.7 °C (−7.1 °F) set on 13 January 1968, while winter lows have dipped below −15 °C (5 °F) during extreme cold snaps. Although frosts are frequent in winter, there is no lasting snow cover in a normal winter due to the mild daytime temperatures. The (now monumental) former building of the Boerenleenbank in the Raiffeisenstraat (in the Centrum). As of May 2018 [update] , the population of Eindhoven consisted of 229.637 persons (according to the CBS). Of these, 29.5% or some 63,873 people are of foreign descent. People are classified as being of foreign descent when they were born outside of the Netherlands, or when at least one of their parents was born outside of the Netherlands. The municipal agglomeration of Eindhoven (an administrative construct which includes only some of the surrounding towns and villages) has 327,245 inhabitants as of 1 January 2010. Of all Eindhoven districts, the historical centre is by far the smallest in size and population, numbering only 5,419 in 2006. Woensel-Noord is the largest, having been the city's main area of expansion for several decades. Eindhoven is located in the southeast of the province of North Brabant. This area is historically Roman Catholic and the population of Eindhoven was similarly mostly Catholic for a very long time until the late 1970s. However, the internationalizing influence of the university, Philips and other companies have created a more mixed population over the last few decades. The spiritual needs of the Eindhoven population are tended by a large number of churches,  two mosques and one synagogue. Eindhoven has grown from a little town in 1232 to one of the biggest cities in the Netherlands with around 212,000 inhabitants in 2009. Much of its growth is due to Philips, DAF Trucks and Brabantia. After the resurrection of the Netherlands in 1815 and the end of the Belgian Revolution, Eindhoven was a small village of some 1250 people in an economically backward and mostly agricultural area. Cheap land, cheap labor and the existence of pre-industrial homesourcing (huisnijverheid in Dutch) made Eindhoven an attractive area for the developing industries which were being stimulated by the government of King William I. During the 19th century, Eindhoven grew into an industrial town with factories for textile weaving, cigar manufacturing, match making and hat making. Most of these industries disappeared again after World War II, though. Philips Light Tower in 2000. In 1891, brothers Gerard and Anton Philips founded the small light bulb factory that would grow into one of the largest electronics firms in the world. 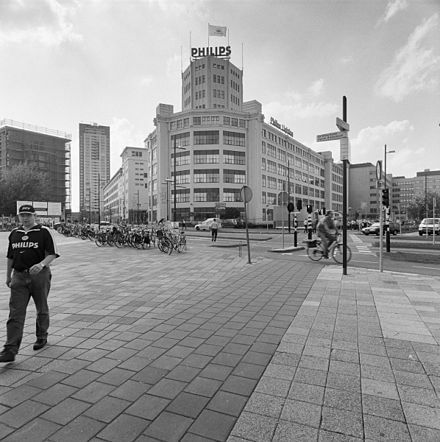 Philips' presence is probably the largest single contributing factor to the major growth of Eindhoven in the 20th century. It attracted and spun off many hi-tech companies, making Eindhoven a major technology and industrial hub. In 2005, a full third of the total amount of money spent on research in the Netherlands was spent in or around Eindhoven. A quarter of the jobs in the region are in technology and ICT, with companies such as FEI Company (once Philips Electron Optics), NXP Semiconductors (formerly Philips Semiconductors), ASML, ALTEN, Simac, Neways Electronics and the aforementioned Philips and DAF. This cooperative tradition has also developed into a different direction than the traditional technology research done at the university. Starting in 2002, the university, the Catharina hospital, Philips Medical and the University of Maastricht joined forces and started joint research into biomedical science, technology and engineering. Within Eindhoven, this research has been concentrated in a new university faculty (BioMedical Technology or BMT). This development has also made Eindhoven a biomedical technology hub within the country and its (European) region. Brainport Top Technology Region:  A cooperative initiave of local government, industry and the Eindhoven University of Technology to develop the local knowledge economy of the Eindhoven region. SRE:  The Samenwerkingsverband Regio Eindhoven is a cooperative agreement among the municipalities in the Eindhoven metropolitan area. Although SRE is far more than just an economic agreement, it includes economic cooperation. The Eindhoven-Leuven-Aachen triangle:  An extensive cooperation agreement between the universities and surrounding regions of Eindhoven, Leuven (Belgium) and Aachen (Germany). Within the Eindhoven region (particularly around Helmond), several parties are working together to set up an automotive testing facility of European scale, for testing and European certification of vehicles. This cooperation involves the Eindhoven University of Technology, TNO Automotive and the different automotive companies in and around Helmond. Eindhoven is one of the co-location centres of the European Institute of Innovation and Technology (EIT). It hosts two Knowledge and Innovation Communities (KICs): Innoenergy (Sustainable Energy) and EIT ICT Labs (Information and Communication Technology). The co-locations are on the High Tech Campus Eindhoven. Eindhoven, being a city with a 200,000+ population, is served by a large number of schools both at primary and secondary education levels. In addition, Eindhoven is a higher-education hub within the southern Netherlands, with several institutes of higher education that serve students from the extended region of North Brabant, Zeeland, Limburg and parts of the surrounding provinces. The Eindhoven University of Technology. The Fontys University of Applied Sciences (Eindhoven branch). The Open University also has a study center in Eindhoven. Among the private institutions is the Centrum voor Kunsten Eindhoven, which offers art-related courses to adults (including a DJ-education). The municipal council is the legislative council at the municipal level in Eindhoven; its existence is mandated by the Constitution of the Netherlands. The Eindhoven city council consists of 45 elected representatives from the Eindhoven municipality. These are elected during municipal elections from candidates running in Eindhoven. Eindhoven politics consists of local branches of the national political parties and purely local parties with strictly local interests. The city council reflects this mix in its makeup. The executive council in Dutch municipalities is called the College of the Mayor and Aldermen (Dutch: College van Burgemeester en Wethouders or College van B&W for short). The mayor is appointed by the monarch, but the council of aldermen is composed as a result of the formation of a local coalition government. This coalition is formed in such a way as to be able to rely on a majority of the votes in the city council. The mayors of the Netherlands are not elected but appointed by the crown. Nevertheless, there has been a movement over the last few years to give the municipalities more say in who will be their mayor, which has resulted in consultative referenda being held in the larger cities to "suggest" a candidate for the post. This was also tried in Eindhoven and as a result the current mayor is Rob van Gijzel (PvdA). On 23 January 2008, a referendum to elect a mayor was held in Eindhoven. This referendum, the second of its kind in the Netherlands, was attended by 24.6% of the inhabitants. This was less than the required 30% needed to make a referendum binding. Nevertheless, the city council would choose the winner of the referendum as the preferred candidate. The main reason for the low attendance was that the candidates, Leen Verbeek and Rob van Gijzel, were from the same party. Rob van Gijzel won the referendum with 61.8% of the votes and was appointed the city's new mayor. If unavailable, the mayor is temporarily replaced by one of the aldermen. 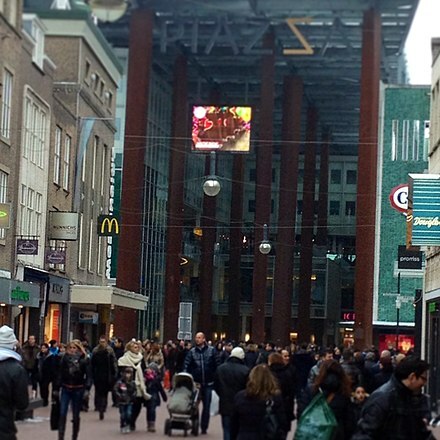 Being a university city, Eindhoven has a large student population. The students from the Eindhoven University of Technology and a number of undergraduate schools give Eindhoven a young population, whose recreational needs are catered to by several different festivals, clubs and such. For a long time Eindhoven was the main location of Philips. The Philips company undertook a lot of effort in the "cultural formation" of its workforce and has given the city both cultural institutions (such as the former POC and the Muziekcentrum Frits Philips) and sporting institutions (notably PSV). Eindhoven is also known as the City of Light, due to Philips originating from there and because of several projects involving lighting up buildings of the city. During Carnival, Eindhoven is rechristened Lampegat (Hamlet of Lamps, although for the ironic purposes of carnival the translation Hole in the ground with lamps is closer to the mark); this refers again to the important role of Philips in the Eindhoven community. There are several cultural institutions in and around the city. There are two museums dedicated to the major topics of the city's industrial heritage: the DAF Museum has a collection of DAF cars and the Philips Gloeilampenfabriekje anno 1891 (across the street from the Kempenland) documents the early lightbulb industry. The former district court house now houses the Designhuis, a public podium and interaction area for modern design and innovation. The Eindhoven Museum is an archaeological open-air museum which focuses on the region's Iron Age and Middle Ages. It merged in 2011 with Museum Kempenland which was a regional museum, which documents the history of the Kempenland region in objects, documents, paint and educational activities. Museum Kempenland's old location, the Steentjeskerk, is closed. The Inkijkmuseum (the Look-In museum; housed in an old linen factory in the Dommelstraat) is a small but special museum: it offers ever-changing exhibits, which are to be viewed through the building's windows. The Van Abbemuseum has a collection of modern and contemporary art, including works by Picasso, Kandinsky, Mondriaan and Chagall. Eindhoven was home to the Evoluon science museum, sponsored by Philips. The Evoluon building has evolved into a conference centre. The Eindhoven public space contains many forms of artistic expression (a book published by the Eindhoven tourist board records 550 as of 2001 and more have been added since), with high "concentrations" of them in the parks. The Stadswandelpark for instance, contains over 30 works of modern art. There are also several other works of art on permanent display throughout the city, such as Flying Pins (by Claes Oldenburg and Coosje van Bruggen, who considered the location on the southern stretch of the John F. Kennedylaan to be like a bowling alley) and Swing (a construct on the Karel de Grotelaan, which morphs into different geometric shapes as you move around it). There are also a number of statues of famous city inhabitants, such as Jan van Hooff (by Auke Hettema, 1992) and Frits Philips (by Kees Verkade) on the Market Square. There is a statue of Anton Philips in front of the central railway station. Eindhoven is also, to some degree, open to forms of impromptu and alternative art. For example, the Berenkuil is a freezone for graffiti artists in the city. Strijp-S is a place for experimentiation with LED lighting, which keeps the historic connection with Philips' past. Some light art includes the project Fakkel by Har Hollands. In the underground passage to NatLab artist Daan Roosegaarde installed his project Crystal. In 1992, the Muziekcentrum Frits Philips was opened as a stage for classical and popular music in Eindhoven, reviewed by critics as a concert hall with acoustics that rival the best halls in Europe. Before that, Philips sponsored the POC. Parktheater Eindhoven is Eindhoven's stage for opera, cabaret, ballet etc. Opened in 1964, it has received over 250,000 visitors every year. With its 1,000 m2 it has one of the largest stages in the Netherlands. With a major renovation ending in 2007, the new Parktheater will receive an estimated 300,000 visitors a year. Eindhoven's Plaza Futura is now a cinema featuring cultural movies, lectures and special cultural events. The general music and theatre scene in Eindhoven (in the broadest sense) is supported by a foundation called PopEi. The purpose of this foundation is to support artistic groups with facilities, especially rehearsal stages and areas (housed in the old Philips location of Strijp-S) but also storage facilities. PopEi also provides a working environment for groups (through cafeteria facilities in Strijp-S, so groups can have real working days) and provides some logistical support for organizing events. Eindhoven has a lively recreational scene. For going out, there are numerous bars on the Market square, Stratumseind (Stratum's End) which is the largest pub-street in the Netherlands, Dommelstraat, Wilhelmina square and throughout the rest of the city. In addition to the more culturally oriented Plaza Futura, there are three cinemas in the centre of town ("Servicebioscoop Zien", "Vue" and Pathé Eindhoven, which offers THX sound, IMAX screens and 3D movie viewing). The premier sporting club of the city is PSV Eindhoven, the professional football club playing in the Eredivisie. Their home base is the Philips Stadion. PSV won the 1988 European Cup as well as 24 Dutch championships. FC Eindhoven is another football club based in Eindhoven, currently playing in the Eerste Divisie. Eindhoven Kemphanen is the major ice hockey club in the city. They play in Ijssportcentrum Eindhoven and compete in the North Sea Cup. Eindhoven High Techs are the minor league affiliate of the Eindhoven Kemphanen and play in the Eerste Divisie. Swimming pool complex De Tongelreep houses various pools for recreation, training and sports research supported by the Eindhoven University of Technology and several top sporting institutions. Its "Pieter van den Hoogenband Swimming Stadium" hosted the 2008 European Championships Swimming, Diving and Synchronised Swimming, the 2010 IPC Swimming World Championships, the 2010 European Short Course Swimming Championships, the 2012 European Championships Waterpolo, Diving and Synchronised Swimming, the 2013 FINA Swimming World Cup, the 2014 IPC European Swimming Championships, the 2017 FINA Swimming World Cup and the 2018 FINA Swimming World Cup. Eindhoven houses Europe's largest indoor skateboard park Area 51 (skatepark) and is home of a lively skateboard culture. Eindhoven has two boxing clubs, The Golden Gloves and Muscle Fit. Eindhoven hosted the 1999 World Table Tennis Championships. Eindhoven Shamrocks Gaelic Football Club are an amateur sports team. The club was founded in 2013 and is based at Oude Bosschebaan 32, 5624 AA in Eindhoven.  . The club is affiliated to the European County Board of the Gaelic Athletic Association. The Shamrocks have won the Benelux Shield Competition in 2017.  .
Eindhoven has a baseball club called PSV, which plays at the stadium which co-hosted the 2005 IBAF Baseball World Cup. Eindhoven has an Australian Rules Football team, the Eindhoven Eagles, due to play in the inaugural Dutch Australian Football Association competition in 2010. Strijp-S is a magnet for urban sports like skateboarding, BMX and bouldering as well as bootcamp classes. The old Philips factory complex has been transformed into a multi-purpose cultural and residential complex called Strijp-S. This includes conference and event space, space for concerts and events, art of lighting, space for sports such as BMX, bouldering, and more, a walking promenade, etc. Eindhoven features several print media. The local newspaper, called the Eindhovens Dagblad, is a daily newspaper with over 110,000 subscribers in the Samenwerkingsverband Regio Eindhoven region. It has a national and international section, as well as a section dedicated to regional news; the editorial department is located in Eindhoven. In addition to the newspaper, Eindhoven is served by a number of weekly door-to-door publications. Chief among these is Groot Eindhoven (which carries publications of the city council, as well as other articles and advertisements). Other than that there are de Trompetter, dé Weekendkrant and the ZondagsNieuws. The first two are delivered midweek, the last two are weekend publications. There are several regional and municipal radio stations. The local radio station is Studio040, whereas Omroep Brabant and RoyaalFM provide regional radio. Local television is provided by Studio040. Omroep Brabant broadcasts regionally from its television studio in Son. Internet, television and telephone connectivity is available via cable television, optic fiber and ADSL. 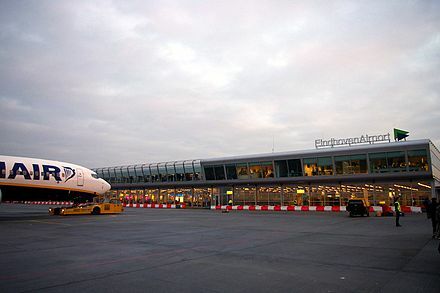 Eindhoven Airport is the closest airport, located approximately 8 kilometres (5 miles) from the town centre. The airport serves as a military air base and a civilian commercial airport. Eindhoven Airport is the second-busiest in the Netherlands (after Schiphol). Ryanair serves London Stansted airport, Dublin, Kiev, Rome, Milan, Pisa, Bordeaux, Marseille, Glasgow, Madrid, Valencia, Stockholm, Kaunas, Malta, Sofia and Barcelona. Wizz air serves Belgrade, Brno, Bucharest-Baneasa, Budapest, Cluj-Napoca, Debrecen, Gdańsk, Katowice, Prague, Riga, Sofia, Timișoara, Vilnius, Wrocław. In the summer season, Reykjavík is served with 2 weekly flights operated by Iceland Express. Transavia services Alicante, Antalya, Bodrum, Corfu, Dalaman, Faro, Gran Canaria, Innsbruck, Málaga, Majorca, Munich, Prague, Rhodes and Salzburg, though some destinations are served only seasonally. Eindhoven Airport served more than 4.6 million passengers in 2015. Eindhoven's central railway station is served by both intercity and local services while the smaller station, Eindhoven Strijp-S is only served by local trains. Towards 's-Hertogenbosch, Utrecht and Amsterdam trains run every ten minutes, on every day of the week. The A2/E25 motorway from Amsterdam to Luxembourg passes Eindhoven to the west and south of the city. The A2 connects to the highway A58 to Tilburg and Breda just north of the city. Just south of Eindhoven, the A2 connects to the A67 / E34 between Antwerp and Duisburg. In 2006, the A50 was completed connecting Eindhoven to Nijmegen and Zwolle. The public transport of Eindhoven consists of more than 20 city bus lines, which also serve neighbouring cities like Veldhoven, Geldrop and Nuenen. Seven of these buslines (400 - 407) are marketed as high quality public transport and run with 43 electric articulated busses. Two specially built separated busways (HOV1 & HOV2) are used by lines 401 to 406. Line 401 to the airport runs almost completely on separated busways. Apart from the city lines there are some 30 regional and rush-hour lines. Like all large Dutch cities, Eindhoven has an extensive network of bicycle paths. Since 2012, the Eindhoven bicycle path network has incorporated the Hovenring. Eindhoven has two hospitals in three locations: the Catharina Hospital and the Máxima Medisch Centrum, which has a branch in Woensel-Zuid (the old Diaconessenhuis) and one in Veldhoven (the old Sint Joseph Hospital). These three have an extensive cooperation and have divided specialties among each other. Emergency medicine, for example, is concentrated in the MMC Veldhoven branch and the Catharina Hospital, the MMC Eindhoven branch has no emergency department. Cardiac procedures are done in the Catharina. Catharina is also an academic and research hospital and participates in a shared research program with Philips Medical, the Eindhoven University of Technology and the Maastricht University into biomedical science, technology and engineering. 's-Hertogenbosch, colloquially known as Den Bosch, is a city and municipality in the Southern Netherlands with a population of 152,968. It is the capital of the province of North Brabant. The Meierij van 's-Hertogenbosch was one of the four parts of the duchy of Brabant, the others being the margraviate of Antwerp, the county of Brussels, and the county of Leuven/Louvain. It got its name from the Bailiff of 's-Hertogenbosch, which administered the area in the name of the Dukes of Brabant. The Meierij roughly corresponds to the somewhat larger Dutch province of North Brabant. Best is a municipality and a village in the southern Netherlands. It is situated northwest of the city Eindhoven, and is also part of the agglomeration of this city. Cranendonck is a municipality in the southern Netherlands. Though located in North Brabant near Eindhoven, the spoken dialect is Budels, rather than Kempenlands. Laarbeek is a municipality located in the province of North Brabant in the south of the Netherlands. It was formed in 1997 from the former municipalities Beek en Donk, Aarle-Rixtel and Lieshout. Laarbeek is part of the city region 'Samenwerkingsverband Regio Eindhoven', centered on the city of Eindhoven. The town hall is located in Beek en Donk. Sint-Oedenrode is a town in the province of North Brabant. Valkenswaard is a municipality and a town in the southern Netherlands, in the Metropoolregio Eindhoven of the province of North Brabant. The municipality had a population of 30,615 in 2017 and spans an area of 56.49 km2 (21.81 sq mi) of which 1.48 km2 (0.57 sq mi) is water. Veldhoven is a municipality and a town on the Gender stream in the southern Netherlands, located in the Metropoolregio Eindhoven just southwest of Eindhoven. The Philips Stadion is a football stadium in Eindhoven, Netherlands, and it is the home of PSV, also known as PSV Eindhoven. With a capacity of 35,000, it is the third-largest football stadium in the country. Established as the Philips Sportpark, it was constructed as a sports field for Philips employees in 1910. The Philips Elftal played football matches from 1911 until 1913, when the team was succeeded by PSV. Since 1913, PSV has used the original ground as its home stadium. Liempde is a village in the Netherlands in the municipality Boxtel. Annually the Flevo Christian music festival is held here. In 2005 the event What the Hack took place in Liempde. Dommelen is a village in the southern Netherlands. It is located in the municipality of Valkenswaard, North Brabant. Dommelen derives its name from the little brook Dommel that runs through it. Having its clear water close at hand, Dommelen is mostly known for its beer brewery from which the brand name Dommelsch is derived. Its other main attraction is an old watermill. Brabantse Stedenrij is a polycentric city region in the province of North Brabant, Netherlands. Its population is about 2 million. The main cities are 's-Hertogenbosch, Breda, Eindhoven, Helmond and Tilburg. Other municipalities of the area are Bergen op Zoom, Oss and Roosendaal. The metropolitan region also includes other large towns such as Boxtel, Etten-Leur, Oosterhout, Uden, Veghel, Veldhoven and Waalwijk. Strijp is a former town in the Dutch province of North Brabant, now a borough of Eindhoven. Nijnsel is a village in the province of North-Brabant, located in the Meierij of 's-Hertogenbosch. Nijnsel is a parish of the municipality of Sint-Oedenrode and has around 2,600 inhabitants. The Watermill at Opwetten is a watermill along the river Kleine Dommel, located on the Opwettenseweg 203 in Opwetten, Nuenen, Gerwen en Nederwetten, in the province of North Brabant, Netherlands. First mentioned in the 11th century, the watermill burned down and was rebuilt in 1764. The following is a timeline of the history of the municipality of Eindhoven, Netherlands. On 6 October 1995, fifteen-year-old Nicole van den Hurk disappeared on her way to work in Eindhoven, in the Dutch province of North Brabant. On 22 November, her body was found in the woods between the towns of Mierlo and Lierop. Strijp-S is a neighborhood and former industrial park in the Eindhoven distrtict of Strijp. The area belonged to electronics company Philips. Since 2000 creative companies and housing have been established in the former industrial buildings. Eindhoven Strijp-S railway station serves the district. ↑ "John Jorritsma" (in Dutch). Gemeente Eindhoven. Archived from the original on 13 January 2017. Retrieved 11 January 2017. ↑ "Postcodetool for 5611EM". Actueel Hoogtebestand Nederland (in Dutch). Het Waterschapshuis. Retrieved 15 April 2014. ↑ "Bevolkingsontwikkeling; regio per maand" [Population growth; regions per month]. CBS Statline (in Dutch). CBS. 26 June 2014. Retrieved 24 July 2014. ↑ "Bevolkingsontwikkeling; regio per maand" [Population growth; regions per month]. CBS Statline; Metro region (in Dutch). CBS. 31 August 2015. Retrieved 13 October 2015. ↑ "Bevolkingsontwikkeling; regio per maand" [Population growth; regions per month]. CBS Statline; CMSA (in Dutch). CBS. 31 August 2015. Retrieved 13 October 2015. ↑ The Gender was dammed short of the city centre in the 1950s, but the Dommel still runs through the city. ↑ "Eindhoven - Groei van Eindhoven (inwoners)". Eindhoven.nl. 30 April 2016. Archived from the original on 6 March 2017. Retrieved 5 March 2017. ↑ "Low level daylight attack on the Philips plant, Holland - WWII Today". 6 December 2012. ↑ "Map and De Nieuwe Gender" (in Dutch). Archived from the original on 2007-08-28. Retrieved 2017-03-05. ↑ "Gereg.criminaliteit; misdrijven naar soort misdrijf en politieregio" (in Dutch). CBS Statline. 7 July 2010. Retrieved 2 September 2010. 1 2 "Dè is toch wè?! Wim Daniëls maakt Brabants theaterstuk 'Een ons komma's' | Hallo 040". Archived from the original on 4 March 2016. Retrieved 7 June 2015. ↑ Wenstedt, Joop (25 September 2010). "Nieuw testlab voor hoogwaardige verpakkingen" [New testing lab for high-grade packaging materials]. Technisch Weekblad (in Dutch). The Hague, Netherlands: Uitgeverij Bèta Publishers. Retrieved 30 September 2010. ↑ "Centrum kunstlicht in de kunst te Eindhoven. Museum voor lichtkunst en lichteffecten" (in Dutch). Kunstlichtkunst.nl. Retrieved 2009-05-05. ↑ "Philips gloeilampenfabriekje anno 1891". Philipsfabriek1891.nl. Archived from the original on 2001-01-24. Retrieved 2009-05-05. ↑ "Brainport". Brainport.nl. 2017-02-18. Retrieved 2017-03-05. ↑ "Home - Brainport Development". Brainportdevelopment.nl. Retrieved 2017-03-05. ↑ Morisson, A. & Doussineau, M. (2019). Regional innovation governance and place-based policies: design, implementation and implications. Regional Studies, Regional Science,6(1),101–116. https://rsa.tandfonline.com/doi/full/10.1080/21681376.2019.1578257. ↑ "Intelligent Community Forum Announces Top Seven Intelligent Communities of 2011". Intelligent Community Forum. 19 January 2011. Archived from the original on 22 July 2011. Retrieved 23 January 2011. ↑ Postma, Renée. "Brabantse techniek terug in de wereld" [Brabant technology back in the world]. NRC Handelsblad (in Dutch). p. 13. Retrieved 23 January 2011. ↑ "ICF Names Eindhoven Region of the Netherlands as its Intelligent Community of the Year 2011". Intelligent Community Forum. 3 June 2011. Archived from the original on 26 July 2011. Retrieved 4 June 2011. ↑ "European Institute of Innovation and Technology: Home". Eit.europa.eu. Archived from the original on 28 March 2010. Retrieved 2011-06-01. ↑ "Databank verkiezingsuitslagen". 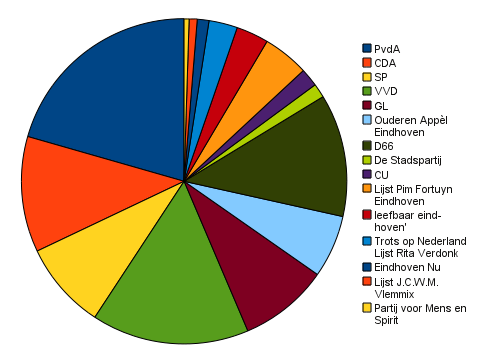 Verkiezingsuitslagen.nl. Retrieved 2017-03-05. 1 2 "College van B&W 2014–2018" (in Dutch). Gemeente Eindhoven. Archived from the original on 3 August 2014. Retrieved 20 May 2014. ↑ 'Lichtproject op Strijp-S pakt Auroralia Award in Lyon', Eindhovens Dagblad. ↑ 'Herbeleef Glow Eindhoven: Routes en hoogtepunten door de jaren heen', Eindhovens Dagblad. ↑ 'Licht zien, voelen en zelfs opslaan op Glow Next', Eindhovens Dagblad. ↑ Evenement. 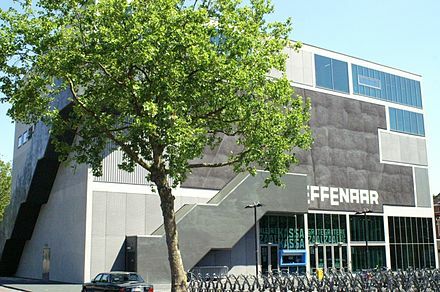 "Effenaar". Effenaar.nl. Retrieved 2009-05-05. ↑ "Studium Generale Eindhoven". Studiumgenerale-eindhoven.nl. Archived from the original on 22 July 2010. Retrieved 5 March 2017. ↑ "Tuna Ciudad de Luz". Tuna Ciudad de Luz. Archived from the original on 24 July 2011. Retrieved 29 August 2010. ↑ "La Tuniña". La Tuniña. Archived from the original on 24 July 2011. Retrieved 29 August 2010. ↑ "Home | POPEI". Popei.nl. 2017-02-22. Retrieved 2017-03-05. ↑ "ABlive gratis festival Eindhoven 23 Augustus 2008". Ablive.nl. Retrieved 2009-05-05. ↑ "Muziek op de Dommel gratis toegankelijk klassiek muziek festival". muziekopdedommel.nl. Retrieved 2013-08-04. ↑ "Stichting Virus – Startpagina". Virus.nl. Archived from the original on 12 July 2017. Retrieved 5 May 2009. ↑ "Profiel: Buurten in Nederland" (in Dutch). NRC Handelsblad. 18 September 1997. Retrieved 2 September 2010. ↑ "Hockeyers Oranje Zwart voor de derde keer op rij kampioen" (in Dutch). NRC Handelsblad. 8 May 2016. Retrieved 19 November 2016. ↑ "Oranje Zwart wint EHL-finale na shoot-outs" (in Dutch). NOS. 6 April 2015. Retrieved 19 November 2016. ↑ "First training session of 2019". 6 March 2019. Retrieved 7 March 2019. ↑ "Benelux Winners 2017". 2017. Retrieved 7 March 2019. ↑ "National Commission for Decentralised cooperation". Délégation pour l’Action Extérieure des Collectivités Territoriales (Ministère des Affaires étrangères) (in French). Archived from the original on 27 November 2013. Retrieved 2013-12-26. ↑ Korolczuk, Dariusz (12 Jan 2010). "Foreign cooperation – Partner Cities". Białystok City Council. City Office in Białystok . Retrieved 2013-03-22. ↑ "Twin towns and Sister cities of Minsk [via WaybackMachine.com]" (in Russian). The department of protocol and international relations of Minsk City Executive Committee. Archived from the original on 2 May 2013. Retrieved 2013-07-21.